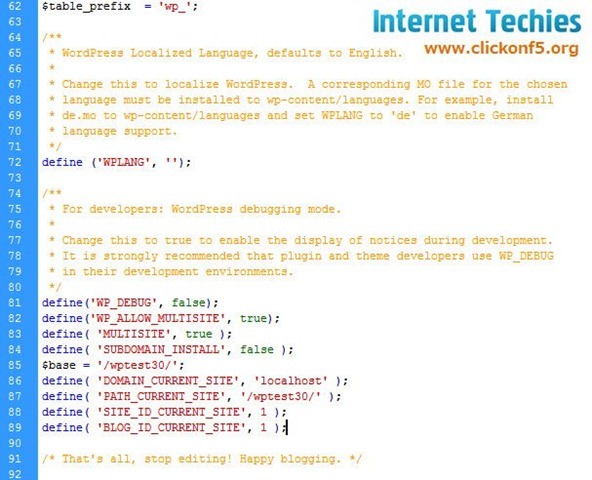 WordPress 3.0 final version is released with WordPress MU and WordPress Merge. 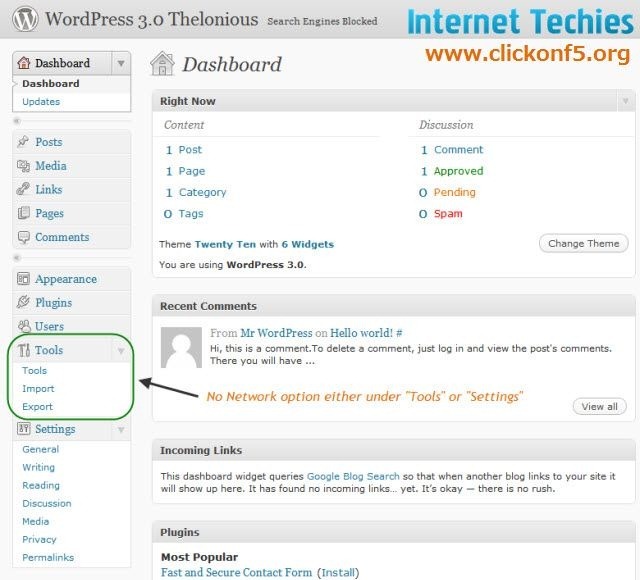 If you want to enable multiple site network on single installation of WordPress 3.0, then here is the step by step pictorial guide to show you the way to enable Network tab, Super Admin etc on WordPress 3.0. 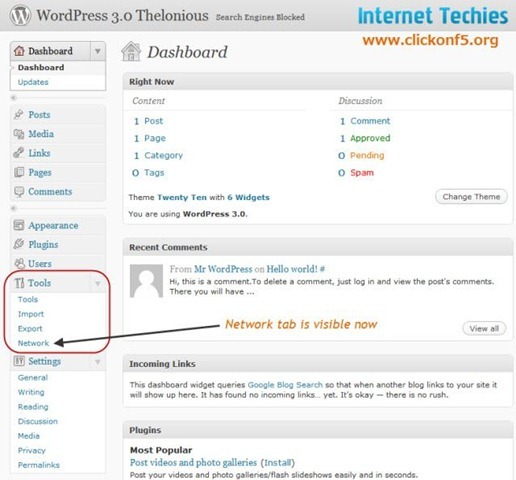 When I released the “First Look of WordPress 3.0 MU Merge” there was a “Network” option available under Settings but afterwards WordPress team removed that from there and added “Network” under “Tools” section. 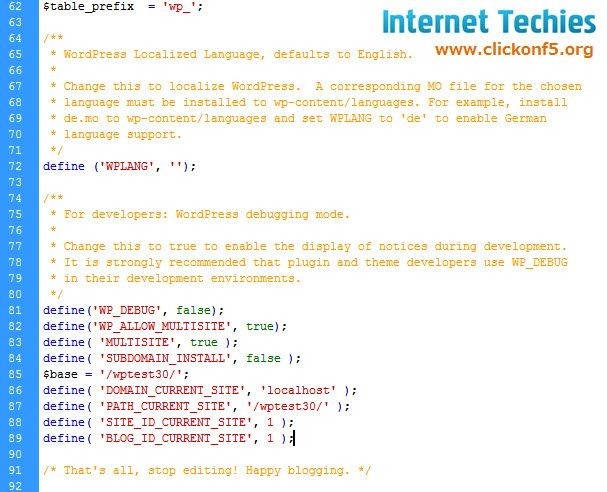 But to get “Network” tab over there, you will have to make some code changes in wp-config.php file. 1. 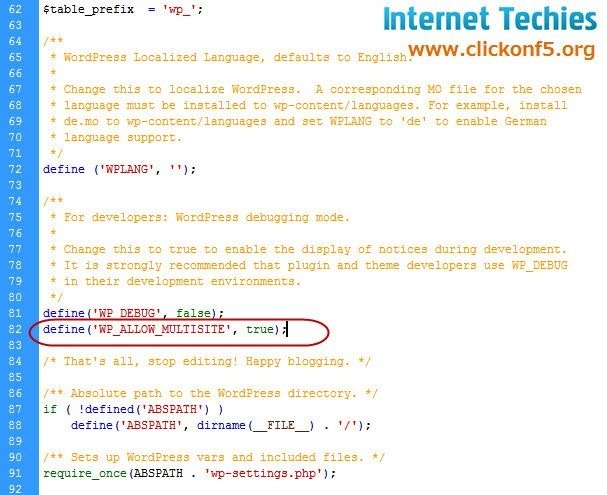 Add 1 line in wp-config.php which is there in the root folder of your hosting account. Without making any changes in wp-config.php, the dashboard will look like as below. You can’s see “Network” options at all. After adding the above line, you can see “Network” tab under “Tools” section on Dashboard. 2. 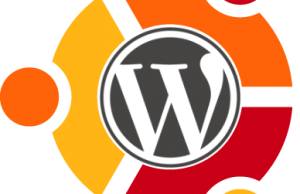 Now click on “Network” to make your WordPress setup ready for multiple site (WP MU). Provide a name to the network site, email address and choose whether you want sub-directory or sub-domain to multiple sites. Subdirectories will make your site’s URL as “yourdomain.com/site1” and Sub-domain will make your network sites as “site1.yourdomain.com”. 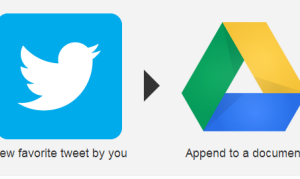 Then click “Install”. 3. 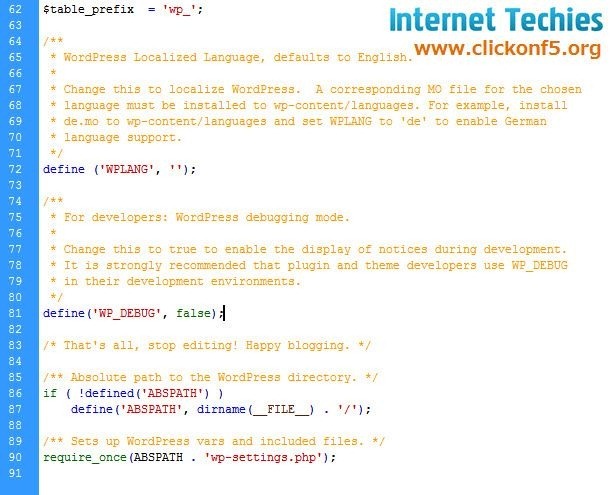 Based on the selection on previous screen, WordPress setup will generated some additional code for wp-config.php and .htaccess files. These both files must be there on root folder of your WordPress site. If .htaccess file is not there in root folder then create a new one with the code shown on the screen. 4. Once you are done with the changes in wp-config.php and .htaccess files and created blogs.dir folder, re-login to the dashboard by clicking the “Login” button at the bottom of the window. 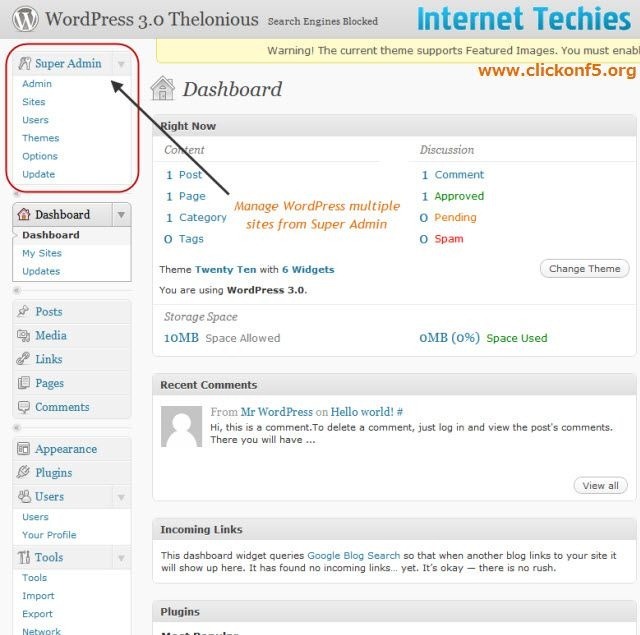 Now you can see “Super Admin” options on the top-left of the WordPress Dashboard. 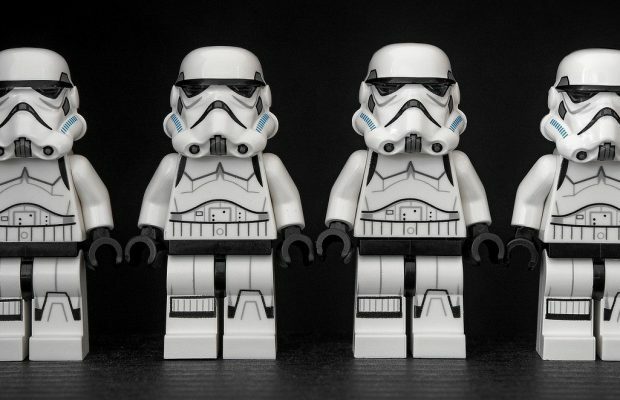 Go ahead and start managing multiple site network like WP MU on WordPress 3.0. Important Note: If you are willing to create multiple site with sub-domain option in the step 2 of above steps, then first of al you will have to add a wildcard sub-domain on your hosting account. wildcard sub-domain is something like *.yourdomain.com. Go ahead and create this kind of sub-domain on your hosting account before enabling sub-domain option on WordPress setup.